The local newspaper just printed my letter to the editor in which I quoted last year's Census Bureau's findings. Beside the fact that the average age of the world population "is increasing at an unprecedented rate"…last year the The US Census Bureau said the 90-or-older population has "tripled"over the past three decades. Also more than 90 percent of 100 yr-olds are women. We are all living longer. I often wonder if any of us will ever live to see the day when preventive medical clinics rise up all over the US with licensed certified nutrition therapists on board. It is time. People are willing to pay to prevent major diseases so they can look forward to a healthier vibrant old age. Some studies also suggest that our state of mind primarily dictates the health of the body. Dr. Ann Wigmore, a pioneer in food therapies, once said "I have seem countless people accept the long wait in the x-ray lab or doctor's office and accept major surgery to the tune of countless hundreds of dollars. Yet to consider changing their eating habits is as if they were being asked to change their religion. Apparently, we more easily accept a chronic disease rather than accept a major change in our eating habits." How true. Life is a continuous journey. We more than stick around when the body is put to rest. Each one of us is so wonderfully taken care of if we just don't get in the way of it. In this electronic age of hyperactivity, being silent and listening can teach us that we are all part of the God consciousness and can never die and that each person no matter how dissolute and depraved is a speck of God. We don't need to put ourselves down just because the ego is constantly telling us we are not enough. 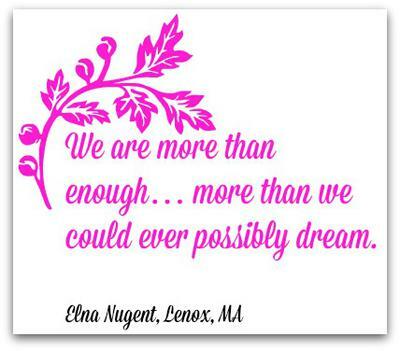 We are more than enough…more than we could ever possibly dream. As I travel my life journey I see myself constantly seeking the truth of the matter about what I read and what I am told and I like to question certain "truths" and to see myself shedding certain dogmas/conditioning as I believe we must continue to change/adapt and transition to live life fully--think outside of what society/religion/culture has conditioned us to believe and think. I have a few friends my age; a few older and some, younger and I am curious about the views of these friends and what makes them tick. I think it is good to learn about others for we all have stories to tell about the choices we are making and have made.